You may have noticed that this spring was pretty bad for potholes. The highways were full of them and some side/back roads were even worse. Avoiding potholes can be complicated, but it’s very important to do as it can cause really bad wear and tear on your vehicle – especially on your tires and suspension system. Have you ever wondered why potholes are such a big problem after a particularly rough winter? It’s all about how and why potholes form. The pressure from vehicles cause most asphalt to bend slightly when a car drives over it. After a while, the asphalt bends and stretches to the point that it begins to crack. 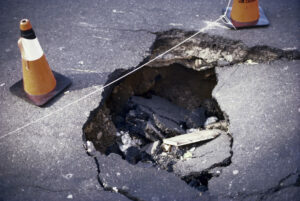 The crack usually starts pretty small near the bottom of the asphalt and grows as more pressure is put on it. During the late fall and winter, water can start getting into these cracks. Temperatures tend to fall below freezing at night in the mid-Atlantic region. When water freezes, it expands inside the cracks. The cracks get wider and deeper as a result. Keep an eye out for potholes, especially in late winter and early spring. If you can drive around them, it’s a good idea. Never drive into oncoming traffic or another vehicle just to avoid a pothole, though. Make sure the area around you is completely clear. Avoid driving over puddles. As mentioned earlier, puddles are frequently potholes in disguise. You never know how deep they are. A puddle could be hiding a sizable pothole that is capable of doing thousands of dollars’ worth of damage. If you can’t avoid a pothole, you should at least slow down before you hit it in order to minimize damage to your vehicle. Following other cars too closely can make it difficult to do this since you may not be able to see the pothole, so it’s always advisable to keep a safe distance between you and the car in front of you. If your driveway or roadway has suffered pothole damage, now is the time to get it fixed. Atlantic Maintenance Group offers asphalt repair in the Baltimore area. Give us a call at 410-768-4720 or contact us via our website today to get a quote or learn more about potholes. This entry was posted on Friday, June 13th, 2014	at 4:53 pm	and is filed under Asphalt	. You can follow any responses to this entry through the RSS 2.0	feed. Both comments and pings are currently closed.